A high-performance, waterproof underlayment and tilebacker, Durock Tile Membrane is perfect for floors, ceilings, countertops and walls in entryways, kitchens, bathrooms, and laundry rooms. Creates an ideal crack isolation solution with an antimicrobial additive to ensure mold and mildew resistance. USG discontinued the Durock tile membrane adhesive. So you are saying Mapei Eco 350 adhesive is the comparable replacement to use with Durock Tile Membrane? Is it the same consistency as the discontinued Durock adhesive? Thank you. Can you use this over drywall? 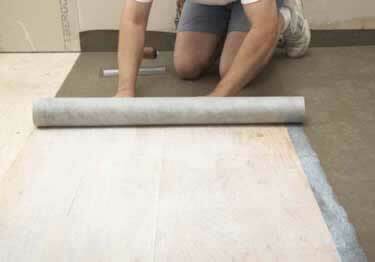 We are looking at your product as an underlayment for our kitchen countertops. How much thickness will be added to the countertop using your membrane and adhesive? I have a 20x20 sun room where there were carpet tiles placed and when I removed them the glue refused to come off the floor. Can I put this right over the cement with the glue still attached to it, then place tile right on top of your product? Can you install a glue down engineered wood floor on this membrane? Can this membrane be used over 3/4" hardwood? Thank you. Can this product be used on walls like in a shower? Do you have a video showing this? I am looking to replace the floor in my bathroom. I have laminate floor in there right now. So my question is: can I place this product over the laminate and then install ceramic tile on top? Can I use this product to lay tile over tile? Thanks! When we purchased this membrane, we needed something that was super thin and durable enough to withstand the height difference in our 2 corresponding floor surfaces. This product has lived up to its name! It was super easy to apply, very durable, easy to work with, and was thin enough to allow me to tile right over it. I will definitely use this product again if I'm in such a predicament. Thank you for having this high-quality product! Thank you for you detailed review. It is truly our mission to only provide quality products, thank you for noticing. Please feel free to call us if you are looking for something that's not on our site. In most cases, if it has to do with floors or walls we can locate what you are looking for. Have used this product as a crack isolation membrane on tile over concrete applications. Applies easily with provided adhesive and provides a very stable base for application of small mosaic to large format tile. Have used other crack isolation systems, but like the thin profile of this product. Would recommend for professional or DIY use, and it can be used over many substrates. Can be reused for up to 1 year after opening. Requires no sealer, cures in 24 hours. Stain resistant for lasting results.